It’s time to head over to the Emerald Isle to play for some golden jackpots! 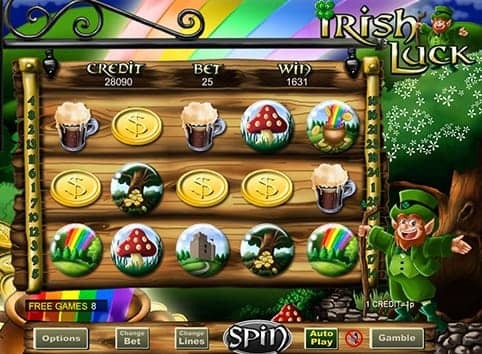 The Irish Luck slot game is one of the very best Irish themed slot games on the internet and we love to give it a spin or two. Join us as we take a look at this game and what it has to offer our players. As an Irish Luck casino, we have this game and everything you need to play it. To get you started, we’ll take a quick look at how to bet and play this game. The design of the game is easy to play with, as all the buttons are easily accessed on the main screen. Under the five reel, three row structure, you will see the betting buttons. These can be used to change the number of lines that are active as well as the amount that you bet on each of these lines. The max amount of lines that you can have on this game is 25, though you can choose just one if you prefer. You’ll need to match up a trio of symbols on these reels to win a multiplier. You can check out the values of each by opening up the paytable, the more you wager on the game the more you can stand to win. There are of course a few bonus features to count on with this game too! Remember that you can also play the Irish Luck mobile slot on your smartphone or tablet through our mobile site. Just head to the exact same URL, log in and you’ll be ready to play! When you take the Irish Luck slot machine out for a spin, you will be able to avail yourself of its bonus features too. This includes free spins, wilds and even some additional perks to play with too. Lets start with the substitute symbol, which is represented by the lucky four leaf clover. This only appears on the second and fourth reels, but it will double what a combo is worth. Then, we also have the scatter symbol for the game, which also doubles up as a bonus symbol too. This is represented by a pixie and this will allow you to start a matching mini game. Just match up the right symbols and you will receive multipliers on top of your bet. You’ll also find the prize pick to be a rewarding feature of this game. Just three leprechauns are required to start this Irish Luck slots bonus feature. Then you’ll pick from these three symbols to reveal prizes, which can include free spins and even more multipliers. Then, you can use the gamble feature to double up what you’ve just won from the game! Irish Luck is a firm favourite of ours and this game is always worth a spin or two. If you like games with lots of additional bonuses then you will really love this one. Play it with us and you’ll be snapping up jackpots left, right and centre.